How fun is this new Polly Pocket toy from Mattel – the Polly Pocket Zip n’ Splash (on sale for $15.99 on Amazon). Polly & friends can actually zip line into the pool (this toy needs water, so it’s a good outdoor on-the-deck or patio toy as the weather gets nice) and play in a tropical paradise. Heck, I want to play in this playset – there’s also a monkey who spins and hands Polly a tropical drink? Was there a Mom in need of a vacation working at Mattel who came up with this playset? Seriously, love it. And while I don’t have girls, I know my boys are fans of any toys that they use water for the toys to play in so I’m sure this one will be a hit with the girls. 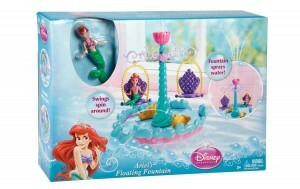 The other water toy release is Ariel’s Floating Fountain Set ($19.99 on Amazon). I’m reading from the reviews that it’s a little tippy in the water but I can see that this would be a good one to set on the side of the tub for kids to play with. Or just outside with the Polly Pocket toy! Again, my kids just love water toys so anything that involves dipping some toys in water is always going to be a bit in our house. And this one involves bringing Ariel into the bathtub so Little Mermaid fans are sure to love! Disclaimer: Samples were received of the above product. As always, all thoughts and opinions are my own.